Great Impressions: Release Week Continues!!! We started yesterday showing all you Great Impression lovers one of our newest releases. In case you missed yesterday's post go back and check it out. All week long we will be sharing projects using the latest GI Stamps! And don't forget, you have a chance to win some of the stamps from the newest release. To win, all you have to do is be a follower of the GI Blog and let us know what you think of the new releases by leaving a comment! You can leave me (Shanna) a little love too. The more comments you leave during the week the better your chances to win! 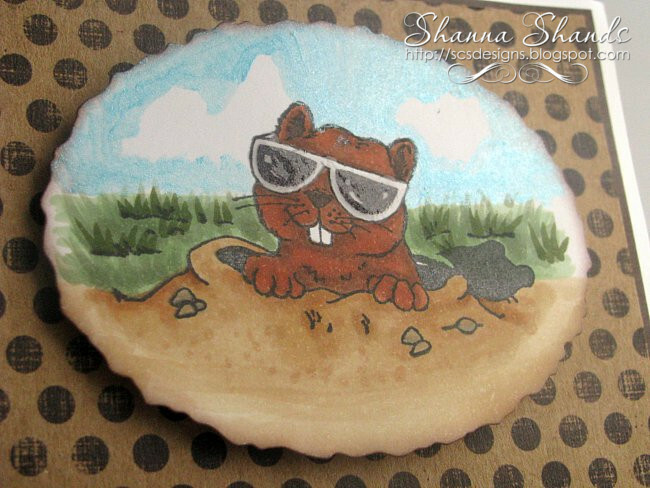 So for my card this week to show you I am using for the image stamp Ground Hog (e762) and the sentiment stamp Sunshine (e763). I colored the image with copics and added some glossy accents to his glasses. 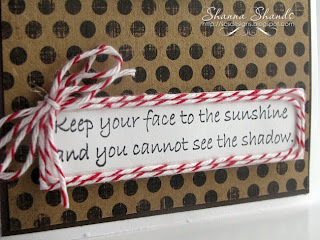 I used some red twine to border the sentiment and pop dots to adhere and pop off the image and sentiment from the card. For the clouds I freehand painted them with some Sky Blu Creative Inspirations Paint. You also have a better view of the shiny glasses. Now check back tomorrow for the next fun post sharing another new stamp from the release. Love your coloring and the fun twine embellishment around the saying. This is such a cute image. Love the colouring of the image and the layout. What a cutie! Great job coloring Shanna and clever use of the twine around the sentiment! Great card, Shanna! This image is so cute - I have it, too! 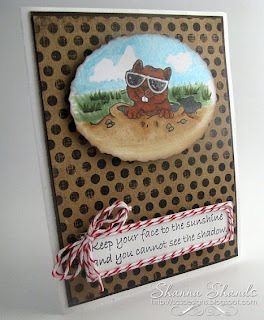 Love the black dots on kraft - really pops the Ground Hog and the sentiment right off the card! this is too cute love the sentiment! Love that shine to his glasses, such a darling card!! Thanks. Laughing at this image...way funny! Love how you added the twine to your sentiment! I love the sentiment with this image! 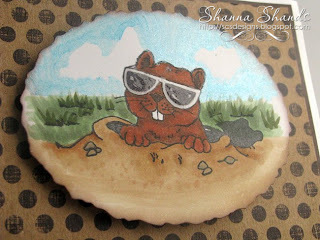 That groundhog is SO cute! You can have so much fun with this stamp. Love it. Great card.